Quit those midnight snacks with TVTA’s new amazing Polar-Bear-in-a-Fridge! Tired? Constantly hungry? Are you fed up of those late-night trips downstairs to the fridge to satisfy your hunger pangs? 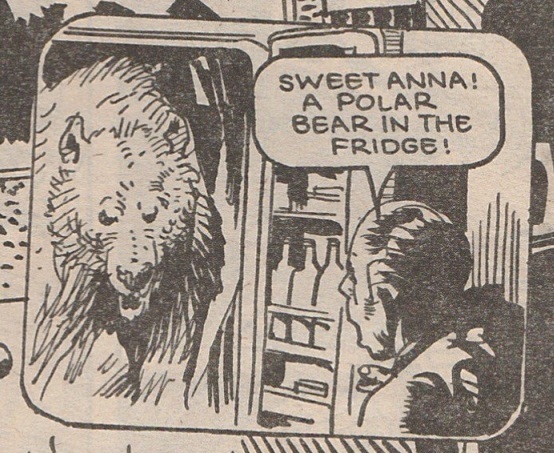 Then choose TVTA’s new amazing Polar-Bear-in-a-Fridge! !!! You’ll never go near your appliance again !!! Lose weight fast !!! See pounds literally fall from your body as you are chased back upstairs !!! Forget about hunger instantly with your own personalised angry polar bear !!! Only at TVTA! The Thirteenth Floor. Eagle comics. This entry was posted in WORDS and tagged fridges, Polar Bears, run away on October 4, 2016 by The Vintage Toy Advertiser.